A massive off-Broadway hit is flashing its way to West Vancouver for a pair of shows this weekend. Now in its 14th year of production – and after having been seen by more than 11 million viewers – Menopause The Musical is set to take audiences on a roller-coaster ride of emotions tonight at 7:30 p.m. and tomorrow at 2 p.m. at Kay Meek Centre. Tickets: $48-$58. A new photography exhibition tackling issues of gender inequality and women’s civil liberties is opening at the Polygon Gallery in Lower Lonsdale tomorrow. Sḵwx̱wú7mesh Nation Basketball: Photographs by Alana Paterson will showcase Paterson’s recent works which focuses on women’s empowerment through sport. Specifically Paterson’s new exhibition will feature bold images after she was invited to shoot the young women’s half of the Junior All Native Basketball Tournament (JANT) held in Vancouver last year. A free opening reception for the exhibition is being held on April 13 at 1 p.m.
All this wildlife calls for some wild art. Visit the Ferry Building Gallery in West Vancouver on Sunday for a free audiovisual presentation introduced by painter Elspeth Bradbury, who portrays local wildlife in a poetic and expressive manner. Alongside her paintings, the audio element of the presentation will feature the pigeons of Park Royal, the Sea Walk otter and the dancing ducks of Tiddly Cove, along with squirrels, crows, raccoons and a contented slug, “sharing” their opinions and experiences. The exhibition-event, titled Wild Life, is slated to run from 2 to 4 p.m. The fifth and final thing to do on the North Shore this weekend sure stinks. 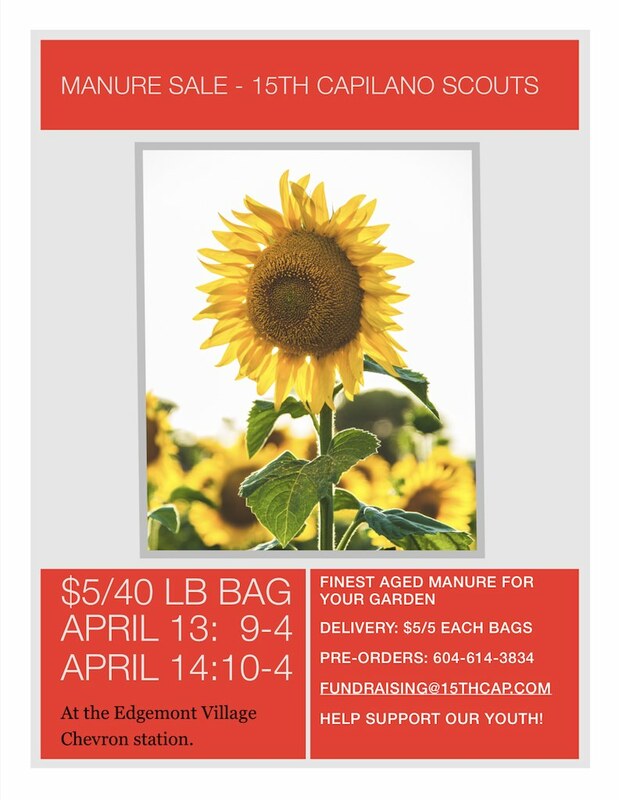 Gardening season is upon us and the 15th Capilano Scouts are stepping up by hosting their annual Manure Sale tomorrow (9 a.m.-4 p.m.) and Sunday (10 a.m.-4 p.m.) at the Chevron station located in Edgemont Village. Billed as having “the finest aged manure for your garden,” $5 will get you a 40-pound bag of the good stuff. Manure delivery is also an option, with the scouts charging a delivery cost of $5 for each five bags delivered. Call 604-614-3834 for pre-orders or email fundraising@15thcap.com for more information. Naturally, all proceeds are earmarked to support the activities of the 15th Capilano Scouts.